for yoga and exercise classes. for healthy vegetarian cooking classes. Balodyan's mission is to promote usage of Indian languages by facilitating instruction in Indian languages. and Marathi is a prominent regional language. 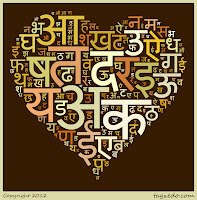 Hindi and Marathi belong to the family of Sanskrit-based languages. Vidya is a STARTALK trained instructor. Balodyan was a recipient of the STARTALK grant for a Summer Hindi camp in 2011.